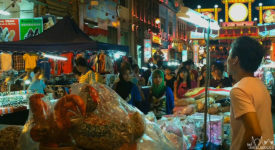 Jonker Street (aka Jonker Walk) in Melaka, Malaysia is one of the coolest night markets in the world. The street food is incredible. 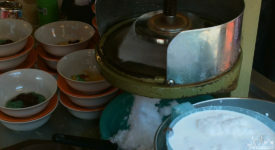 Within this video you can see several different types of Malay food being prepared including popiah, fried radish cake, and squid balls. You could spend over an hour waiting on Jonker Street to watch Master Ho Eng Hui use only his index finger to poke a hole through a coconut or you could watch this 30-second video.